GOWANUS — There's a new piece of trash floating on the Gowanus Canal, and it's a real work of art. Harvest Dome 2.0 arrived on the polluted waterway Friday afternoon and will spend the next six months anchored near the Third Street bridge. The floating orb is made of 450 discarded umbrella frames and 128 empty two-liter soda bottles. Its designers, architects Amanda Schachter and Alexander Levi of SLO Architecture, want the piece to call attention to the toxic canal and its potential for renewal. 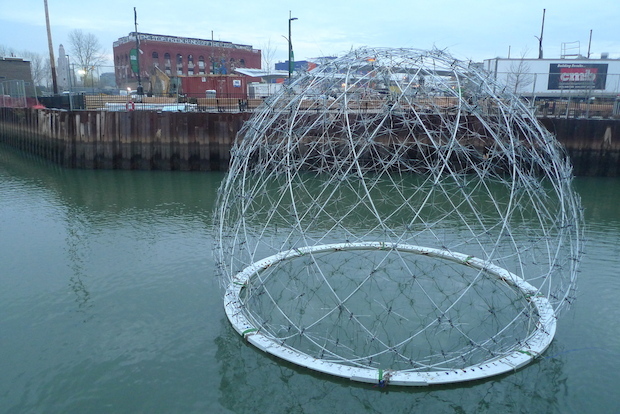 On Friday afternoon, the dome arrived by barge from Governors Island, where it was recently on display in an art fair. Before that, Harvest Dome 2.0 was docked in Inwood Hill Park. The voyage to Gowanus didn't go quite as planned. The barge couldn't make the entire trip, so volunteers had to tug the 700-pound dome with ropes from the shoreline. Progress was tortoise-like, but the Harvest Dome came within a few yards of its final destination as the sun was dipping behind the Kentile Floors sign late Friday afternoon. The dome will be anchored in the branch of the canal that runs behind the Whole Foods gourmet market that's opening in December on Third Avenue and Third Street. It will be visible from the bridge that crosses the canal on Third Street. Levi — who helped guide the dome, which is 24 feet in diameter, into place from a canoe — said he wants viewers to see the piece as "beautiful, haunting and transformative." "It may have been garbage at some point, but it comes back and has a second life," Levi said. "It lets people dream a little. It's supposed to give the sense of beauty that comes with a new life." Locals hope that concept will become a reality for the canal itself next year, when the U.S. Environmental Protection Agency starts a cleanup aimed at reversing decades of pollution in the manmade waterway.